Here’s a historical artwork. What era does this look like to you?! 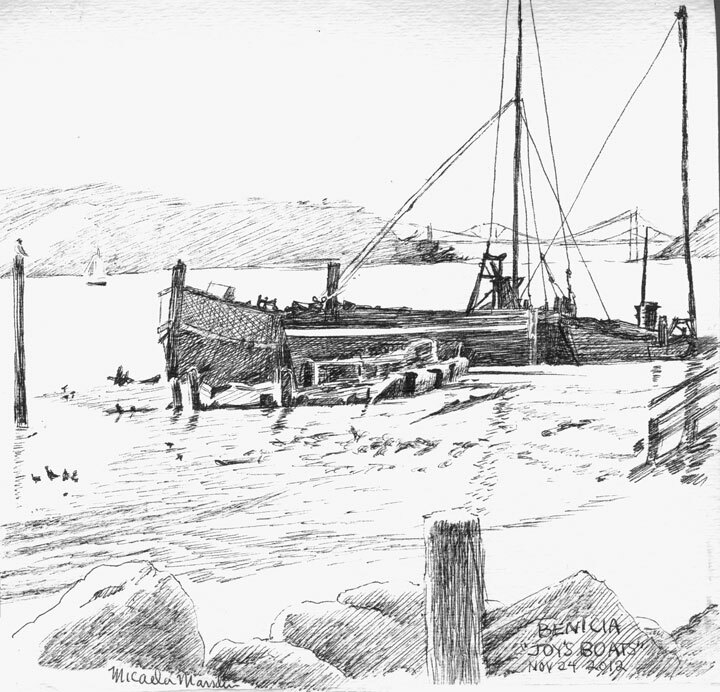 These few remaining bits of waterfront character/history are slated for removal in Benicia. Demolition of the Red Baron and surrounding structures in Joy’s Harbor, is being arranged without public input. Many artists have found them valuable subjects, myself among them! Joy’s boats with the Carquinez Bridge in the background. The mast is actually crooked! The Albany Public Library hosted a viewing of the second presidential debate, with commentator George Lakoff. It was great to watch it with a room full of people interested in the future of our country who have a good sense of humor besides. George Lakoff had very enlightening comments on why the deep divisions of today exist, and how they could be changed. He is the author of Don’t Think Of An Elephant! as well as many other books. People fought hard for our right to vote – so get down to your local polling place tomorrow! Please study the issues, they are often not what they appear to be. Consult with trusted sources to get an understanding of these issues. 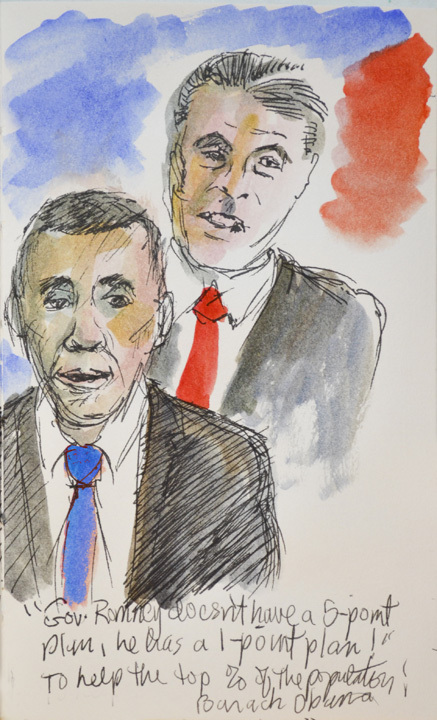 Posted on November 5, 2012 November 5, 2012 Categories 500 faces project, ink & watercolorTags art, Barack, Barack Obama, debate, ink, Mitt Romney, Obama, president, presidential debates, sketch, United States, watercolorLeave a comment on Vote tomorrow! Taking Bart, getting out at the Fruitvale station, put us right into the Dia de los muertos celebration on October 28th. This is a day to honor your loved ones who have passed along to another world, and to celebrate life. My two sketching friends and I stayed til the crowds got too thick to be able to draw without getting our elbows bumped! 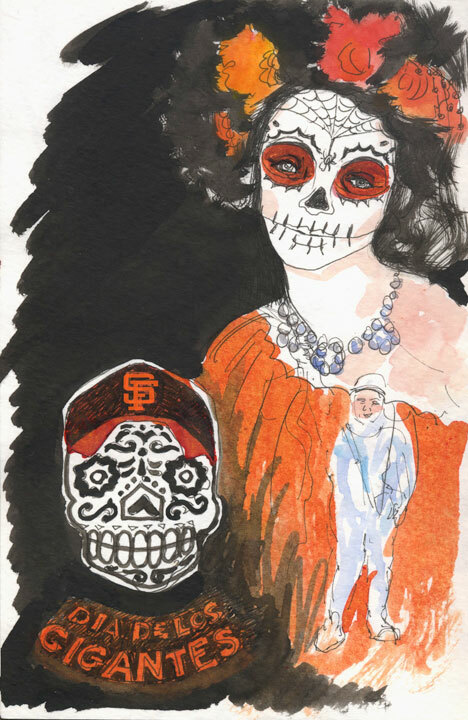 Dia de los gigantes (Day of the Giants) image from a t-shirt, and a woman dressed and painted for the festivities. 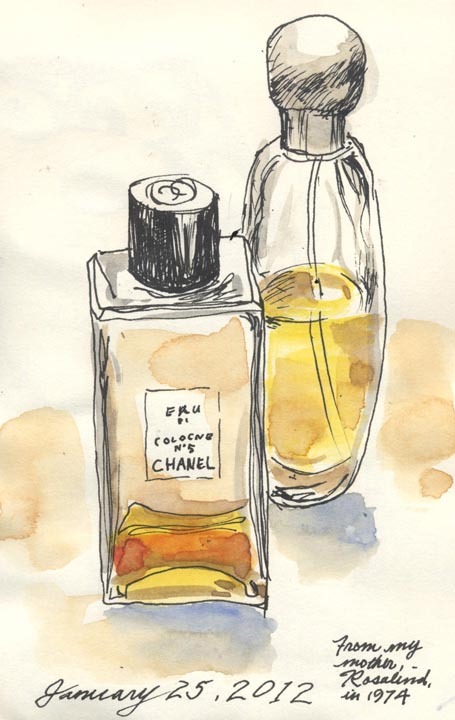 My mother gave me this Chanel in about 1973 or 74. As you can see, I use it sparingly, but it is getting down to the bottom of the bottle. It’s still one of my favorites. I recently went into a Macy’s, saw some for sale with a “tester” — it smells the same!